PARIS (AP) — France’s latest efforts to reduce pollution will also affect nature lovers hitting the countryside for an outdoor meal: Under a controversial new ban, picnickers won’t be able to buy plastic goblets to drink their beloved wine, or plastic knives to make ham and butter baguette sandwiches. Life in the office will be different, too, as coffee machines will no longer cough out plastic cups, as part of the country’s plans to be more environmentally friendly. The new measure, which took effect last month, gives producers until 2020 to ensure that all disposable dishes sold in France are made of biologically sourced materials and can be composted. It follows a ban on plastic bags, in place since July. While several other countries and some U.S. states have also banned plastic bags, France appears to be the first country to introduce a blanket ban on plastic dishware. It comes after Paris hosted a landmark conference last year on fighting global warming, and as the Socialist government tries to push France toward the forefront of environmental progress. While ecologists’ organizations lauded the French law and hope it sets an example for other countries, opponents argue that product bans hurt consumers, and that the French measures violate European Union rules on free movement of goods. Worried that the French ban could extend to other countries, Pack2Go Europe, a Brussels-based organization representing European packaging manufacturers, says it will keep fighting it. The ban was initially proposed by the Europe Ecologie-Greens Party and was adopted by French lawmakers with the aim of reducing the energy consumed and waste produced by the plastic processing industry, as well as the pollution caused by plastic litter. The ecologists wanted the ban to be introduced as soon as 2017 but it was postponed until 2020 because of Environment Minister Segolene Royal’s initial opposition to the law. Royal deemed it an “anti-social” measure, arguing that families struggling financially make regular use of disposable tableware. 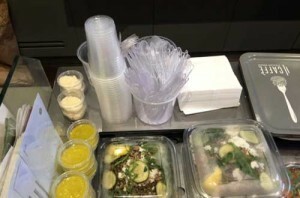 The measures will ban sales of single-use plastic cups, plates and glasses unless they are made of bio-sourced materials that can be composted in a domestic composting unit. Bates argues that there is no proof that bio-sourced disposable cutlery is more environmentally beneficial, and that no products made from bio-sourced plastics will degrade in a domestic composting unit. Officials at the French Environment Ministry did not respond to requests by the AP for comment.